Preferred Cooking Instructions: From frozen bake at 400 degrees for 10 minutes, reduces heat to 350 degrees and bake for 6-8 minutes or until internal temperature reaches 165 degrees. A vibrant bouquet of colors and fresh from the garden flavor leads Kabobs’ center-of-the-plate Fire-Roasted Vegetable Polenta Cake. Meeting the dietary requirements for both Vegan and Gluten-Free life styles, this savory and colorful entrée provides elegance and dramatic plate presentation, with little preparation. 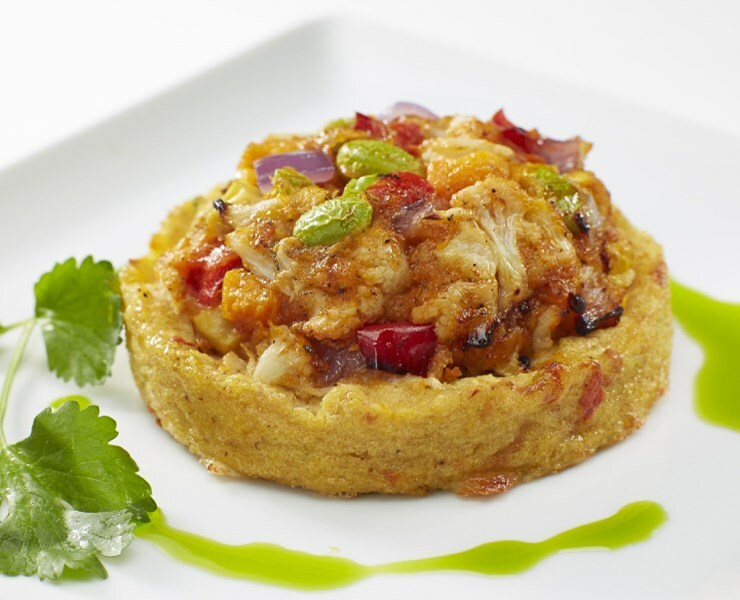 To make this artistic masterpiece, Kabobs’ chefs combined fresh hand chopped cauliflower, butternut squash, red bell peppers, edamame, yellow squash, and red onions; and placed them on top of an herb polenta cake with soy-based Mozzarella and Parmesan cheese. Serve as-is, or pairs well with an infused cilantro oil or a light creamy tomato sauce. Simple preparation, no thawing required. A vibrant assortment of red, blue, and white thin and crispy corn taco shells, lightly dusted with sea salt.